“The Oscars of Surfing”: 5ones Pick for R.O.T.Y. Looks like it’s just about time for Billabong to start shelling out again. The nominees for the 9th version of the Billabong XXL awards were recently announced and the talent is as stacked as ever. With their press release reference to being known as surfing’s version of the academy awards, Billabong obviously sees this show as head and shoulders above the other award shows currently featured in the industry. The grand poobah of the XXL is the Ride Of The Year award. 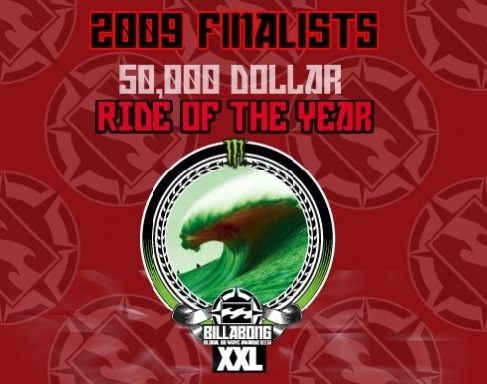 With top honors pulling down a smooth $55,000 between surfer and filmer, the winning team will no doubt be able to finance plenty of post-XXL awards show debauchery for all of the contestants nominated. Our pick? It appears it will once again come down to rides from Teahupoo or Shipstern’s Bluff. Shane Dorian’s 2008 winner at Teahupoo bodes well for Garrett McNamara’s 2009 entry. However, based on the opinions of a focus group that consisted of some of Nicaragua’s top up and coming rippers, we’re going to make the call that Ryan Hipwood’s bit of madness at Shipstern’s Bluff will indeed win top honors this year. On a side note, If Mark Healey’s wave at Yeti doesn’t end up pulling in the win for Monster Tube, there could very well be rioting in the streets. To grab a look at all of the finalists, just head over to Billabong XXL’s home site. Posted by Shaun	on Monday, March 30th, 2009	in Surfing. -How Good Are You at Surfing?